Please refer to our stock # 230 when inquiring. Chinese Song style clair de lune glaze peach-shaped water pot, moulded with five flying bats around the upper part of the peach-shaped body and two lotus buds in relief issuing from the bottom, applied exterior overall with clair de lune glaze. 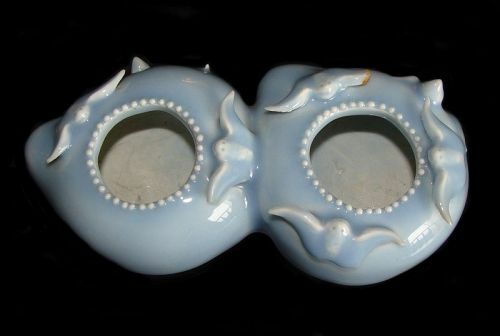 Interior glazed bluish-white, the base left unglazed. No markings. Condition: Part of one of the bat wings has been chipped off. Other than that no other noticeable cracks or breaks.